When Viktor Botte left his homeland of Siberia 21 years ago, he never envisioned that he would establish, own and operate a major printing facility in Cloppenburg, Germany. 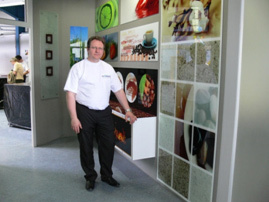 After more than a decadworking in the automobile glass industry, he founded “Cloppenburger Glashaus” in 2000 with a small staff. 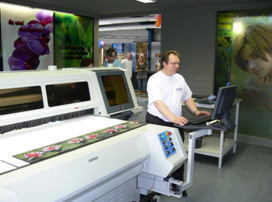 After several years of success, Viktor began searching for ways to expand his business and began looking at the grand format printing industry.In order to venture into this new industry, Viktor realized that he would have to make an investment of more than a hundred thousand Euros. This type of investment needed thorough consideration, such as production, profit margin and staffing. Viktor attended a multitude of shows, conducted numerous tests and visited several showrooms before making a decision. Finally, in 2009 he made the conclusion to purchase a TeckStorm XL from Teckwin. The Teckwin TeckStorm XL offers a print size of 2 by 3 m and inks not needing any special pre-treatment (such as priming). Thanks to a variable drop size of 8 to 40 pico-liters, even the smallest letters and finest details can be reproduced with very smooth color transitions and shapes. White ink, standard with Teckwin systems, is available for printing of solid areas, areas with different shades and gradations, and spot areas in different densities for transparent or high density light blocks. When printing with Teckwin UV inks, post processing at high temperatures for curing ceramic inks is not necessary. Since UV inks used with the TeckStorm behave like standard silicon, the curing process can be sped up by applying heat at about 150°C. The TeckStorm XL has the ability to print on ceramic tiles, glass and metal. This has completely revolutionized the home design industry and made it possible to customize kitchens, bathrooms, furniture and much more. Wall panels, highly sophisticated glass doors and floor tiles for separating offices and private areas can now be printed that give the effect of wood or marble. 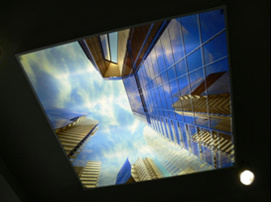 Ceilings can be designed with integrated lights and light effects. Kitchen back-splashes, shower stalls, bar desks and even glass furniture can be made with security or laminated glass. Print on one glass plate, then laminate with a special film called PCB or EVA and place a second plate on top to create two plate security glass. The result is a quality protected print and a highly secure glass plate that can be used universally. 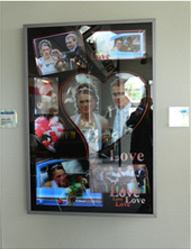 A remarkable new idea utilizing printed glass plates fixed one behind the other in a dedicated light box offers breath-taking impressions for high quality product promotions, weddings and special occasions. • First, they choose the right glass quality. For standard applications for use in private areas (furniture, etc), float glass can be sourced from any glass shop with varying sizes and thicknesses rather inexpensively. For printing on float glass it is important to use the correct side since floating glass has both normal and a thin side. For use in public areas and places where special protection against crashes must be warranted, safety glass or laminated glass must be used. • Next, they look at the image. If white ink is needed usually some extra preparation has to be done. 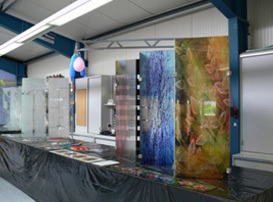 The staff at Cloppenburger Glashaus is extremely knowledgeable and will either offer you support or do the job for you. • Finally, they check color resistance, operating conditions, etc. They determine whether there is a need for post processing, coating, placing in a frame or lamination. 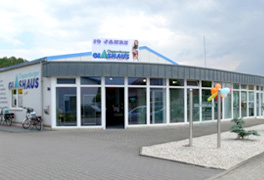 Whatever desires or expectations you may have, the extensive experience and professional courtesy that Cloppenburger Glashaus offers make them the ideal partner and supplier for architects, home builders, artists and many more in Cloppenburg and beyond. The printing area is separetd from the showroom by a big glass plate A light box equipped with several printed glass plates in different levels give a real special presentation of unforgettable moments, gives a real 3D feeling and are suited for special high quality presentation, art, etc. Fine details and smooth color shades will be even more supported when printed on glass. Color Service, Inc., in Monterey Park, CA, opened its doors in 1957 and was initially one of the premier color separators for commercial lithographic printing in the Los Angeles area. After finding success in offset, the owners jumped into large format printing in 2010. Offering large format digital printing and finishing capabilities helps Color Service bring display and point of purchase (POP) jobs in house. “As budgets are shrinking in conventional litho printing and conventional separation, we needed to grow to augment sales,” explains Ariel Minguez, GM, Color Service. 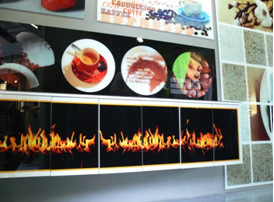 Today, about 25 percent of its business is large format, and about half of that is used for display purposes. The company offers offset and digital printing, design, packaging, and distribution services. 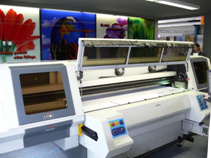 Large format printing in the retail display and POP space remains strong, although the business is fragmented and quantities have decreased slightly. An advantage of producing consumer-focused POP is that the graphics are changed out consistently to constantly engage consumers. Minguez sees a slight decline over the last few years in run lengths. “People a few years ago had runs that were longer. Now marketers are buying smaller runs and targeting in-store display and POP more carefully. Instead of doing 3,000 or 4,000 display pieces, they are doing a few hundred. Or going from three or four displays in a single store to just one,” he details. 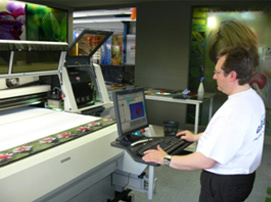 Color Service relies on a 41-inch Heidelberger Druckmaschinen AG Speedmaster CD 102 offset printer for larger quantities. Smaller quantities are cost effective on a 64-inch Epson Stylus Pro, and a 138-inch TeckPro UV3200 roll-to-roll printer and a 126-inch TeckStorm TS600 flatbed printer from Teckwin Development Co., Ltd. A Caldera Graphics RIP runs on all. The company uses other tools such as a 68x120-inch digital flatbed cutter/router, a vinyl heat steamer, a GBC Orca III laminator from ACCO Brands, and a 54-inch cut lettering plotter. The shop is in the process of purchasing a radio frequency welder for fusing vinyl products and is currently investigating a digital cutter. The new Teckwin roll-to-roll printer with white ink option and the flatbed were chosen for speed, frequency, and resolution. The addition of the devices ramps up the volume of work Color Service can complete as well as the production level. “We bought the Teckwins to move more aggressively into the large format display and POP business,” adds Minguez. POP and display work requires unique designs and media selection. Application, shipping, and installation must be taken into consideration. 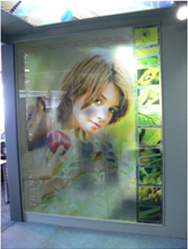 Clear adhesive vinyl is one of many substrates that Color Service uses. Each project is significantly different, utilizing products like Gator and foamcore from 3A Composites USA. 2011 marks the 110th anniversary of Children’s Hospital Los Angeles. It was topped off with the opening of a $636 million facility in the Summer of 2011 and a city-wide re-branding initiative. 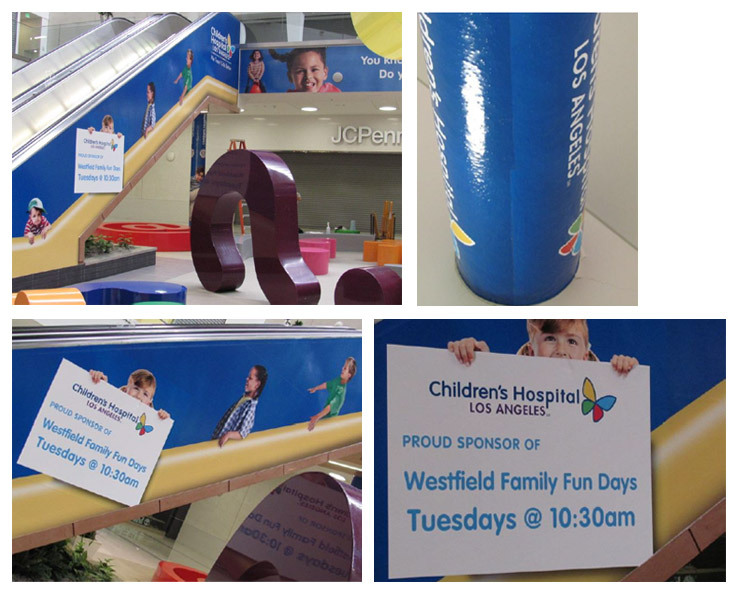 Color Service helped Children’s Hospital Los Angeles execute grand-scale marketing displays in Westfield Shopping Malls in Culver City, CA and Sherman Oaks, CA. The displays, under the direction of Color Service’s client Ideaology Advertising of Marina Del Rey, CA, adorned high-impact targeted family areas near children’s play spaces in the malls. The hospital promotional display project utilized Color Service’s Teckwin printers. The output included escalators and columns wrapped with bright and glossy printed graphics. Other project features included vinyl banners suspended from the ceilings and wall-mounted displays. 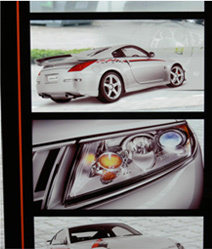 Most of the applications utilized coated vinyl to stand up to heavy traffic. The material used in the interior wrap elements was 3M Graphics Market Center’s Controltac Graphic Film IJ180 and Scotchcal Luster Overlaminate 8519. A 30x60-foot outdoor sign was constructed using 13-ounce vinyl from Ultraflex Systems, Inc. The work Color Service does presents obstacles on occasion, but many retail POP and display users are experienced, knowledgeable print buyers. “When your client is savvy they always roll with the challenges that happen during the project,” says Minguez.